With mediaFACTS a modern analytics strategy and information tool has now been created for the more than 1,000 users in eleven different departments. It is intended to meet the very diverse demands on the analysis of critical performance indicators and to provide reports needed quickly and reliably. The consistent application of IBCS® Standards in the visualizations in mediaFACTS ensures that the complex content to be conveyed is reduced to the essential. 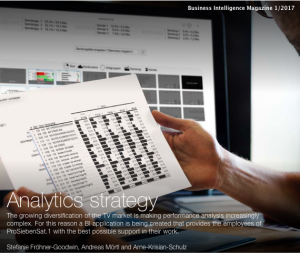 Arne-Kristian Schulz is Head of Visual Business Analytics at blueforte GmbH, a management consultancy for business intelligence and visual business analytics.